Yellow Dog Bread Company is a new bakery venture from Tanya and Matt Andrews of Raleigh. Named after their beloved dog Ellie (a yellow lab), the bakery is nonetheless all about treats for humans. Trained at Stickboy Bakery in downtown Fuquay-Varina, the Andrews focus on local and organic ingredients, like flour from Lindley Mills in Graham, NC. Yellow Dog is based in North Raleigh and is currently in the process of finding a location for a retail spot. In the meantime, they are selling their goodies at farmer’s markets in Five Points and North Hills. I’ve had the pleasure of sampling a number of their breads, cupcakes and cookies, and they are excellent. Yellow Dog has a ton of potential, and we look forward to hearing and seeing more of the Andrews, and of course to tasting more of their delicious creations! 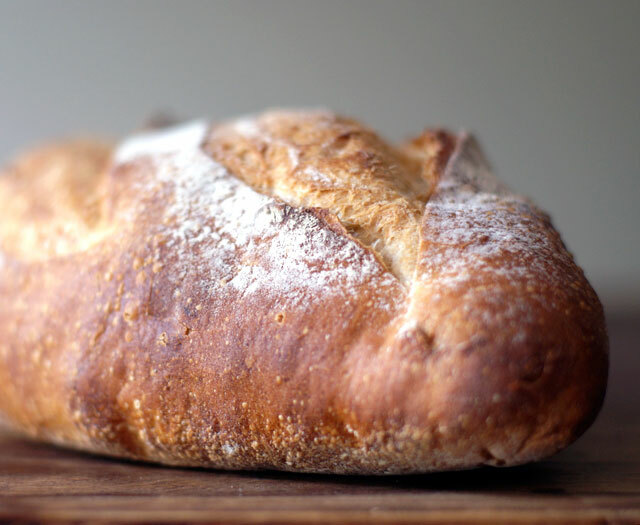 This entry was posted in Food and tagged artisan bread, Raleigh, yellow dog bread by Ben. Bookmark the permalink.